As always, huge thanks to those who waded through "Lord of the Flies" for September's read. 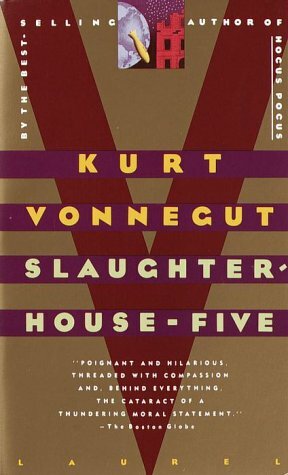 On October 1st, we move on to "Slaughterhouse-Five", by Kurt Vonnegut (not all THAT slaughtery apparently, don't judge a book by its cover). This is one which I personally am excited about, as not only does it have big Lost connections about time travel and what not - it also uses these out-there elements as devices to reflect the human condition (quite a Buffyesque style by the sounds of it, which I'm a big fan of). The book will undoubtedly also cater for the big sci-fi junkies amongst you anyway, so let's look forward to a great book and great Forum discussion about it! A little memo - we're going to be removing the "live chat" function, as its becoming difficult for peeps to get online at a specified time, and also its hard to use the main chatroom and moderate. The forum discussion threads for the books remain strong, and Chat can always be used to discuss the book on an informal basis (which to be honest, is what I've been doing with the last two books mostly). Monthly reads will still OFFICIALLY last for about 3 weeks, with a cooling off period of a week which I'll use (like with this post right now) to advertise the forthcoming reads. However, threads remain open, so read-time is essentially the full month if you wish. Please let me know if you have a comment to make about this shake-up. On a brighter note, November's book has already been decided, and it will be.... Alice in Wonderland!!! By this, we mean both "Alice's Adventures in Wonderland" AND "Through the Looking-Glass, and What Alice Found There". The idea of two-in-one sounds like book club suicide, but in fact most later editions available do print the two together in a combined book - so hopefully it still should be easy to source. The voting for November was tied between Alice and The Third Policeman, but I decided after October's book (which is tricky to source), we should go with a widely available book before Third Policeman (which could be December's if you vote for it!). Anyway, you have over a month to find an Alice book. As usual, you can be an early bird by checking USA library locations to borrow, or Amazon to buy. Internationals - check your local libraries or regional Amazon!